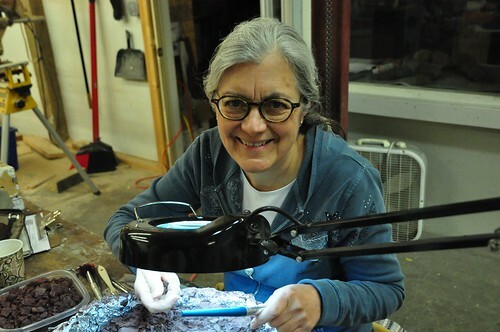 Today’s post is from Michele Whisenhunt, a volunteer on the Museum’s paleontology team. She’ll be sharing photos with us while the team is at the Black Hills Institute, prepping Willie, the Dimetrodon the team discovered. Missed the team’s first dispatch from the field? Check it out! 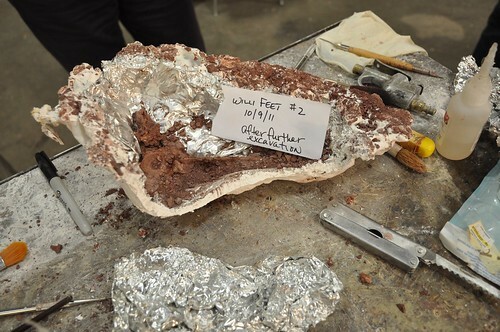 While excavating Willie, the HMNS paleo team also discovered several small pockets of unidentified bones. They were jacketed and sent along with Willie to the Black Hills Institute. Today, volunteers Mary Anderson and Kathy Zoehfeld were each given one of these small presents to open. Dr. Bakker was fairly sure Kathy’s jacket held a Secodontosaurus jaw. A Secodontosaurus is a Permian Pelycosaur. He has a fin like Willie, but is smaller in size. He has a longer snout and a narrower skull than Willie as well. Kathy carefully started digging into her jacket, unsure exactly where this delicate jaw was located. Layer by layer she picked away at the rock matrix, finding nothing. Finally she found the tip of the jaw, then the first few teeth. Kathy doing some fossil prep work in the lab. Unlike Kathy’s jacket, Mary’s jacket was a complete unknown. The jacket was labeled “Willie’s feet”, but Dr. Bakker did not remember anyone finding Dimetrodon feet. Mary started digging…and digging…and digging. We started joking that the team had made an empty jacket as a joke. And she kept digging…FINALLY, she found bone! She called Dr. Bakker over. He looked at the edge of bone and suddenly burst out OH! OH! I don’t know….She kept exposing more bone and then Dr. Bakker knew…it was not even close to being Willie’s feet—it was a Secodontosaurus vertebrae and neural spine. A match to Kathy’s animal? We will have to wait and see. I’m so excited to hear about these Secodontosaurus discoveries! I can’t wait to see them. Next Post Celebrate The International Year Of Chemistry!